As you start the college baseball recruiting process, you need to know what you don’t know. And sometimes it feels like you would rather not know than try to make sense of all of the information out there. Not only is there so much information out there, so much seems contradictory. Sometimes you just need a baseline to start with so that you can make sense of the rest of the information. So before drowning in Google search results, try these resources first. It’s important to approach the college baseball recruiting process with an understanding of what the odds are of playing at the next level. Start with the NCAA Estimated Probability of Competing in Athletics Beyond the High School Interscholastic Level. Once you let these numbers sink-in and understand that not everyone gets to play D1 baseball, you can target the schools most likely to recruit you. If you’re serious about playing baseball at the college level, you need to know the rules for recruiting. Not knowing the rules is not an acceptable excuse for violations. Knowing the rules will also allow you to make it as easy as possible for coaches to recruit you. You should download the NCAA Guide for the College-Bound Student-Athlete and the Play NAIA publications. And if you have any questions, call the organizations and ask! Chances are that athletics isn’t going to be your free ride to college, especially not in baseball. College costs money and here are three sources to help you understand how you can pay for it. D1 baseball teams have a maximum of 11.7 scholarships per team. Read the 11.7 Reality Check to understand what this means for you. The amount you pay for college depends on how much the college decides that your family can afford to pay which is called the Expected Family Contribution (EFC). You need to understand EFC before you even start your college search. If you’re expected to commit to a college before you even fill out the FAFSA, then you need to have a Financial Aid Pre-Read. When a coach asks a player for grades and test score information to share with the admissions office, he should offer a financial aid pre-read as well. High School Baseball Web. This is an excellent site with general information on the college baseball recruiting process. It also includes a forum where you can get most of your questions answered. College Confidential Athletic Recruits Forum. This forum covers all sports but a lot of information is the same for all sports. And you can still get baseball specific information. Put Me In, Coach: A Parent’s Guide to Winning the Game of College Recruiting by Laurie A Richter. Out of all the college athletic recruiting books, I liked this one the best. Must Read For High School Baseball Players and their Parents. This is about an email that a college coach sends to the father of a high school player. Pay attention and make sure it isn’t you. At least half of getting recruited to play baseball is being organized. I remember reading a book on how to get a job and it said that you have to get through all the no’s before you finally get to the yes. The faster you got through the no’s, the sooner you would get to the yes. Same with college baseball recruiting, the sooner you eliminate those schools that don’t want you, you can find the ones that do. And that requires being organized. Athletic Profile. Have one. Just creating one will help you get organized. It will make it easier to fill out online recruiting forms (yes, you have to do those too) and will give you something to send the coaches as a follow-up. Timeline. Understand the timeline for recruiting in terms of the college coaches needs and the academic school year. Academics. Academics count. Any time you put into improving your grades or test scores will significantly improve your chances of being recruited. D3 Baseball. The division with the most teams in college baseball is D3, the one without athletic scholarships. Too many players wait until they don’t get offers from other schools to start checking out D3 schools. If you start out by learning about D3 schools, you’ll see what kind of talent ends up at such schools and maybe adjust your expectations accordingly. The College Solution: A Guide for Everyone Looking for the Right School at the Right Price (2nd Edition) . 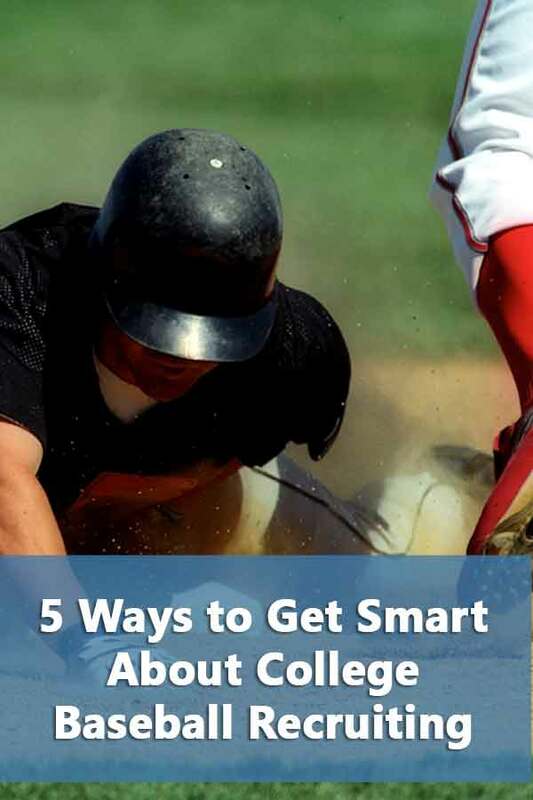 While trying to play on a college baseball team adds to the college search process, the basics of trying to find a college are the same. If you’re only going to read one book on finding and applying for a college, this is it.